Yogurt for Baby – When Can You Introduce Yogurt to Baby? Yogurt is a yummy food produced by the the bacterial fermentation of milk. Cows milk is the most common type of base for yogurt, but milk from water buffalo, goats, ewes and even camels can also be used to make yogurt. Yogurt can be a yummy and healthy first food for baby, full of calcium they’ll need for strong bones! Whole milk yogurt also contains an impressive amount of vitamins and minerals for baby. Check out the nutrition for just one cup of yogurt for baby! Did You Know: Yogurt is also a great source of protein! Because of it’s culturing process, the protein is easily digested by little tummies. Warning: Giving baby yogurt can cause an allergic reaction in babies with milk allergies. Milk allergies occur in approximately 2 to 3 percent of all infants. Symptoms of milk allergy include: diarrhea, vomiting, irritability, swelling and skin rashes. Click here to learn more about food allergies in babies. 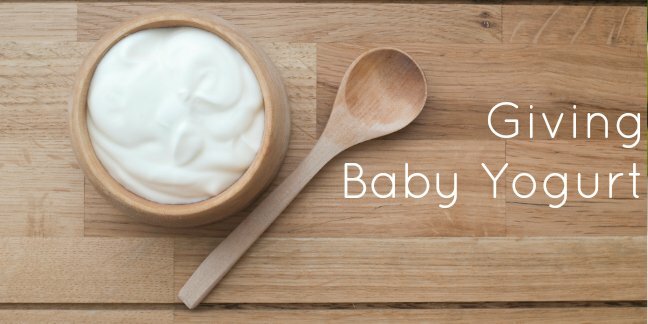 When Can My Baby Start to Eat Yogurt? Most pediatricians recommend starting your infant on Yogurt around 7-8 months of age. Some pediatricians also recommend yogurt as a great first food (from 6 months+). Selecting a Whole Milk Yogurt is the most beneficial to your infant as babies need fats in their diets for proper growth. You can buy plain whole milk yogurt for your baby from companies like Stonyfield Farm, Cascade Fresh and Brown Cow. You can also Make Your Own Homemade Yogurt. Stonyfield Farm also makes the YoBaby brand that many parents know and love. However, using a large container of plain whole milk yogurt will save you money (and save on added sugar) and give you the flexibility of adding your own flavorings to baby’s yogurt. Why are Yogurt and Cheese Ok for Baby Before Age 1 Year Old? Yogurt and cheese are a bit special when it comes to introducing these 2 foods considering that they are dairy products. Unlike Whole Cow Milk , your baby is not at risk of formula/breast milk being replaced by Yogurt or Cheese. The medical community worries that if Whole Cow milk is introduced to an infant prior to 1 year old, that parents would stop formula and/or breastfeeding and use Milk as the replacement. This would possibly be dangerous to your baby’s health! They, however, neglect to specify the difference between baby drinking milk and eating yogurt and/or cheese. Lactose is broken down with the culturing of the yogurt or cheese and milk proteins are either semi-removed or limited. The culturing makes yogurt and cheese easier to digest. Many people with lactose intolerance often are be able to eat cheese and/or yogurt without trouble. The same is often true for some people with a milk protein (either to the casein or the whey) allergy. So why do doctors say “No Dairy Until After 1 Year” if Yogurt and Cheese are Ok? As noted above, the medical community fears that parents may stop formula/breastfeeding and start their kids on whole cow milk earlier than 1 year old – unless they were told not to. Many pediatricians do not explain that yogurt and cheese are ok for your baby from 8 months old and on. Visit the Baby Smoothies page for more great yogurt ideas! And speaking of “that” brand of yogurt marketed to babies (between the ages of 8 months and 12 months old), the YoBaby brand does contain natural organic sugars. The sugar content is less than in a brand such as Dannimals and it is natural and not refined or chemically processed sugar. There are no additives such as starches, fructose syrup, gelatin etc in the Stonyfield YoBaby brand either. Yogurt does contain sugar even if it is not added directly to the yogurt! You may be surprised to learn that all yogurts, even the Plain yogurts, will contain sugar. The sugar occurs naturally in dairy products is called lactose. This “dairy” sugar is not an additive and we feel that is an important distinction to make.